Wahoooo! 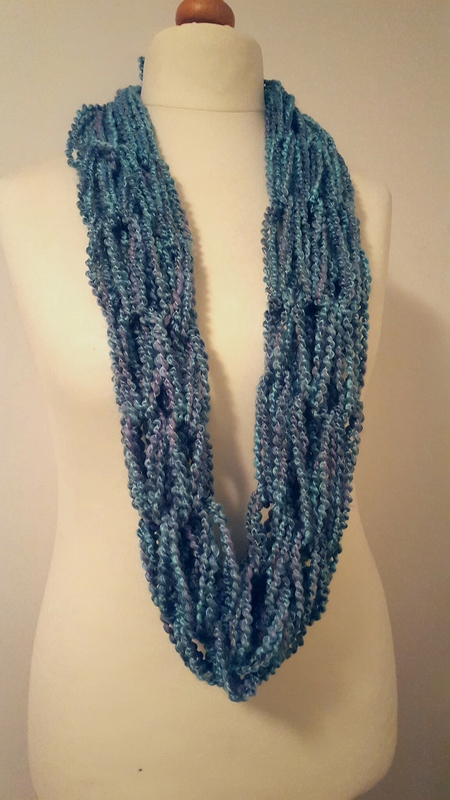 I finally finished my first ever knitting project. This cute autumnal scarf. I made it using Knitcraft Hug It Out yarn. It took 600g in total. I used 12mm needles. It is a basic rectangle with 15 stitches on the needle. I just carried on knitting one row and purling the next until it was long enough. Then turned the remaining yarn into pom poms for the 4 corners. I will be honest – I really do think I prefer to crochet. I fell so much more confodent as i understand how crochrt works where as I think knitting is still a bit of a mystery. However there are so many beautiful hand painted yarns that really do look so much more lovely in knited projects so I think it is worth perservering. Anyone have any knitting projects that they think a beginner would get some benefit out of? Have you ever bought beard oil. Many of the blokes in my family have beards so I have gifted beard oil many a time, and I can tell you something – beard oil is expensive! Like, £10 for around 20ml kinda expensive! Thats a lot! The worst thing is, it has such basic ingredients! So, I figured why not give it a go myself? And this is what I came up with! Tins or jars to store the oil in. Here is how you make it. 1. Take a jar of coconut oil. 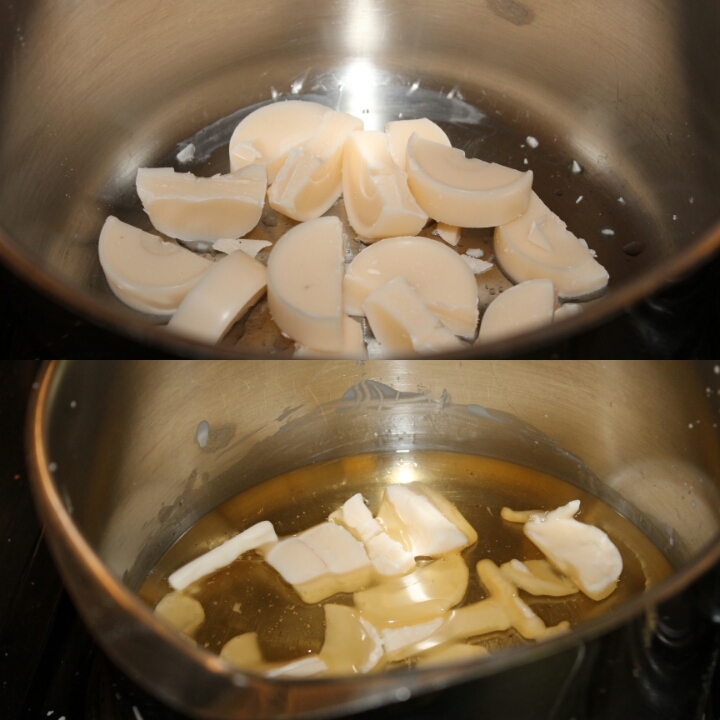 Place the contents into a pan and melt on the lowest heat. 2. 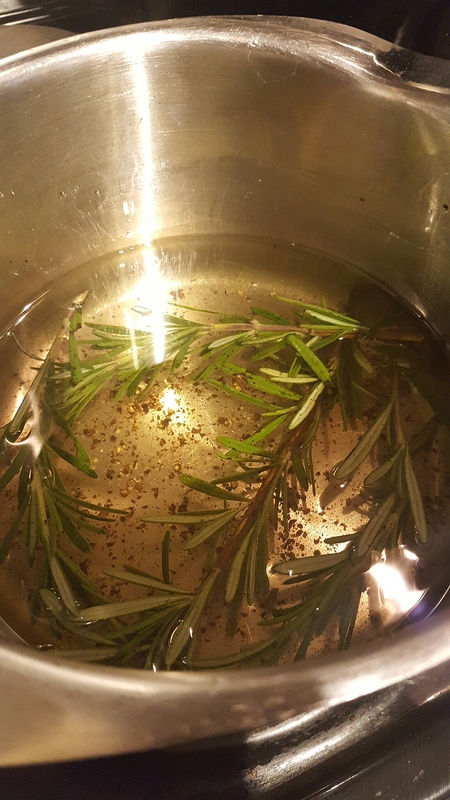 Once a liquid state has been reached, drop in a good load of sprigs of rosemary. 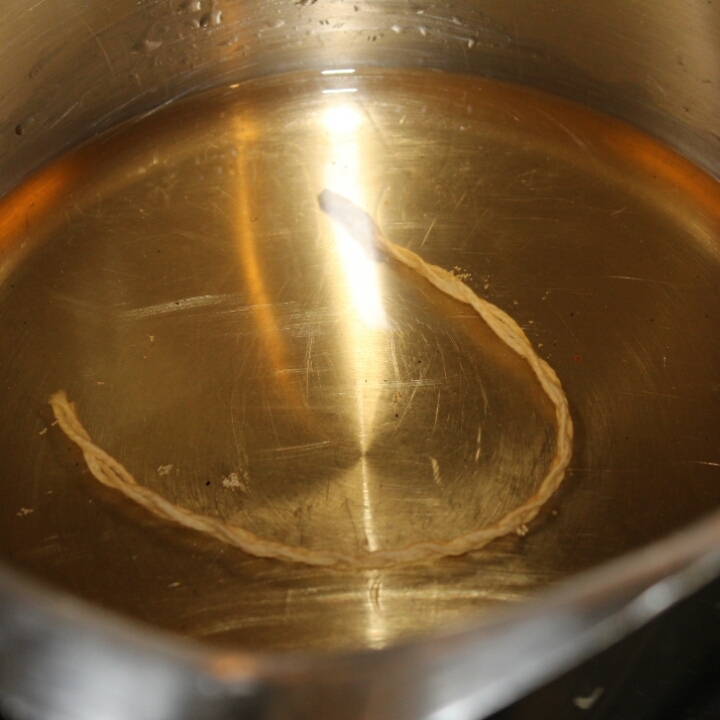 You can chop a sprig or bruise it with the side of a knife to release more oil if you like. 4. Add in a mixture of whole and ground black peppercorns. 3. Leave to sit for a good while on a low heat. The key here is to not let it get too hot! We dont want to fry the rosemary after all. 4. Once you can smell the herbs, you should take the oil of the heat and leave to cool, before decanting the entire mixture back into the jar. 5. Seal the jar and leave to infuse for at least a week. 6. After a week is up, empty the contents once more into the pan and melt it down. 7. 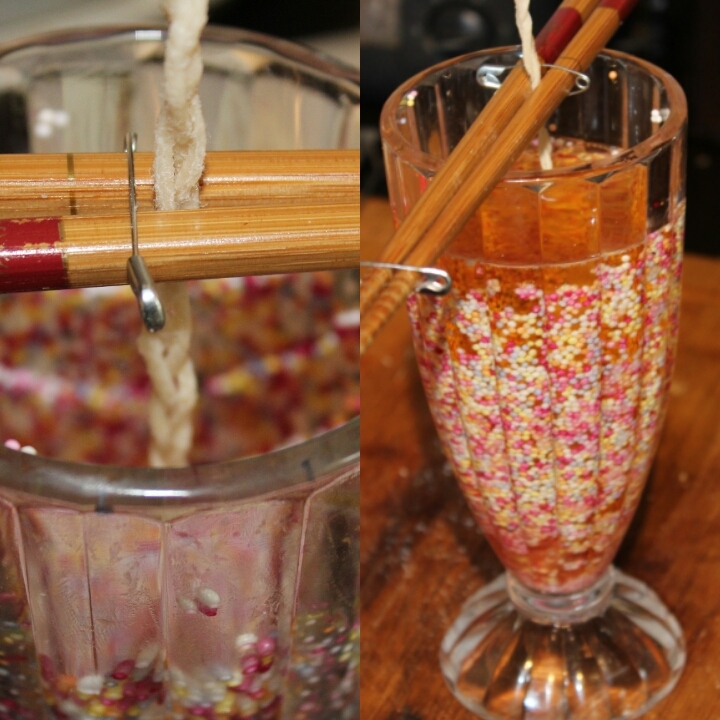 Once fully melted, Pour the mixture through a seive into a glass jug, to filter out all debris. Then pour into the tins/jars and leave to set. You can speed it up by refridgerating. There you go! Simple right! My two testers love it and are surprised themself at how easy it is! And the best part? I can make around 25 times as much for a third of the price! As I said at the start of this post, a small bottle of beard oil can cost £10 or more for around 20ml. I can make around 500ml of this beard oil for just £3! Bargain! And because it is solid it is also more portable! Its a ein win as far as I am concerned! If you wanted to customise it yourself you could use any herbs. I think mint would be extra nice, or perhaps basil. Or you could give it a go with flowers too, maybe the petals of a rose or a stem of vanilla, or maybe you could use spices such as cinnamon. Go on, have an experiment! I would love to see what you come up with! Wahoooooo! I have just 1 more day then I finally go back to work! I am so excited! Being a lady of leisure has been lovely. I have been able to be more creative. I have been able to improve my blog tenfold. I have added more recipes to my dinner repetoire. And most importantly I have been able to relax – my last job was so stressful, it was so high pressure and it wore me down. A combination of poor pay (we were payed less than the living wage, and werent given any extra pay for overtime, bank holidays, or even for working boxing day), complete lack of respect from the company, ridiculous hours, and poor working conditions. Lack of any natural lighting (I often did 10 hour shifts in a room with no windows at all) meant I had to take supplements. We are supposed to get 70 micrograms of Vitamin D a week but I was diagnosed with a severe Vitamin D deficiency and was prescribed 1500 Micrograms a week for 4 weeks just to get my levels back to normal. As well as this I had to take iron and folic acid. So as you can imagine it takes time to recover. So the 3 months of being a lady of leisure has been very beneficial. But now I am chomping at the bit to get back to work! Anyways, I am popping in today to share with you a new skill that I learnt! I learnt to Knit! Well, I have learnt to Arm Knit. 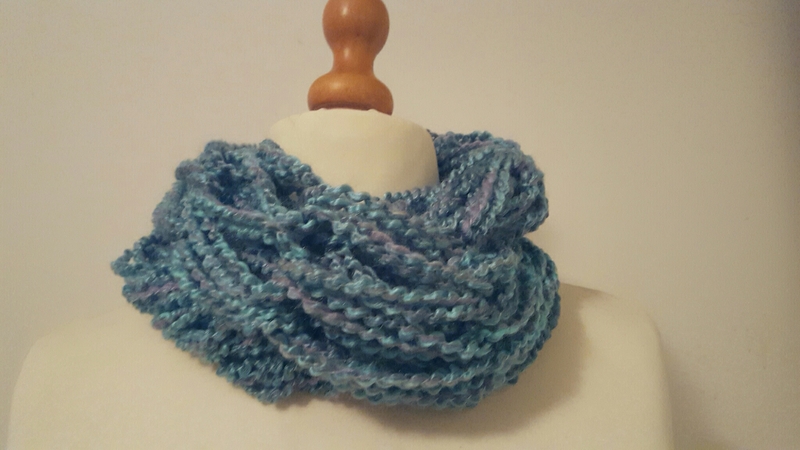 My mum and I went to a fayre together on Friday, and towards the end we came across a stall that was offering an arm knitting lesson with supplies for £5 with the promise you would walk away with a finished infinity scarf! Bargain! So we booked ourself in. This is what I made! They had the yarn for sale too so I bought a ball and promptly on my arrival home showed off my new skill by my partner by making another. I love them! They are so simple! I think I may just wack out a bunch of them as reserve gifts! 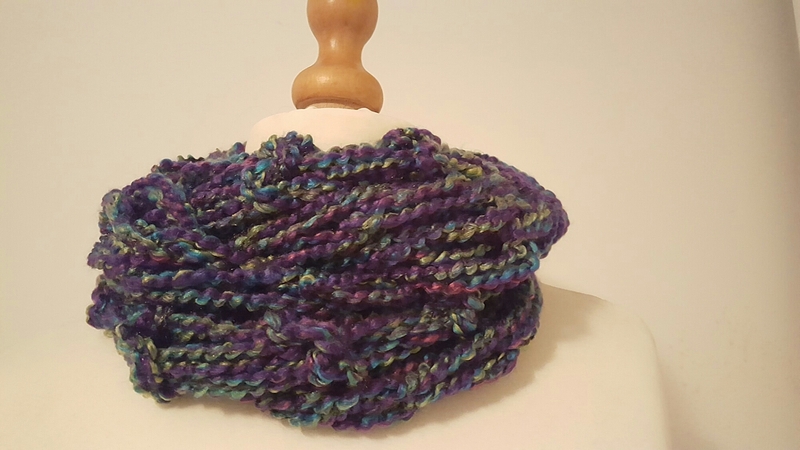 The yarn is lovely a soft. it is Hayfield Ripple. What do you think? 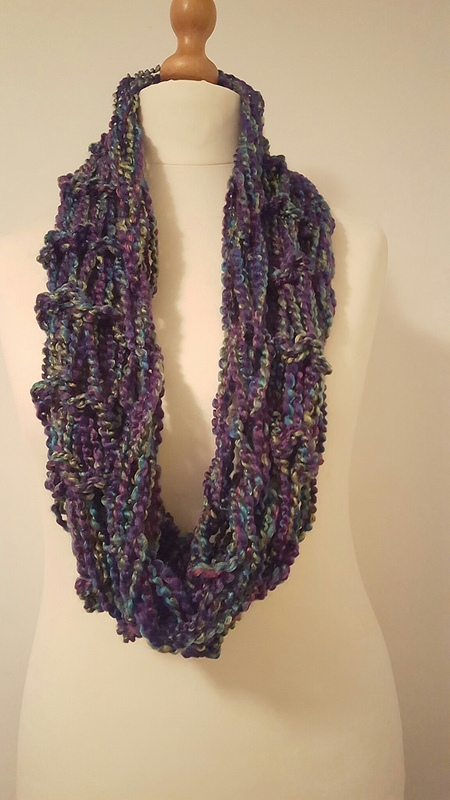 If you are stuck for christmas gifts it is a super quick ski to learn and once you have mastered it you can make a scarf in 15 minutes and maybe a blanket in an hour or two! Yay for speedy projects! I recently went to London MCM Comic-con. 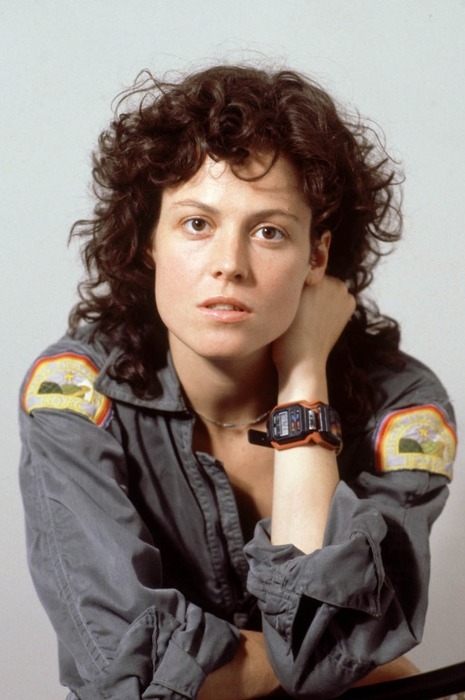 As my costume, I decided to go as Ripley, from the first Alien film. The costume itself wasn’t too complicated. I already had a grey boiler suit from when I was an X-Wing pilot when I went to the Starwars Secret Cinema last summer. I just had to attatch the relevent patches to the relevent places. The patches can be purchased on Ebay or Amazon for around a tenner. 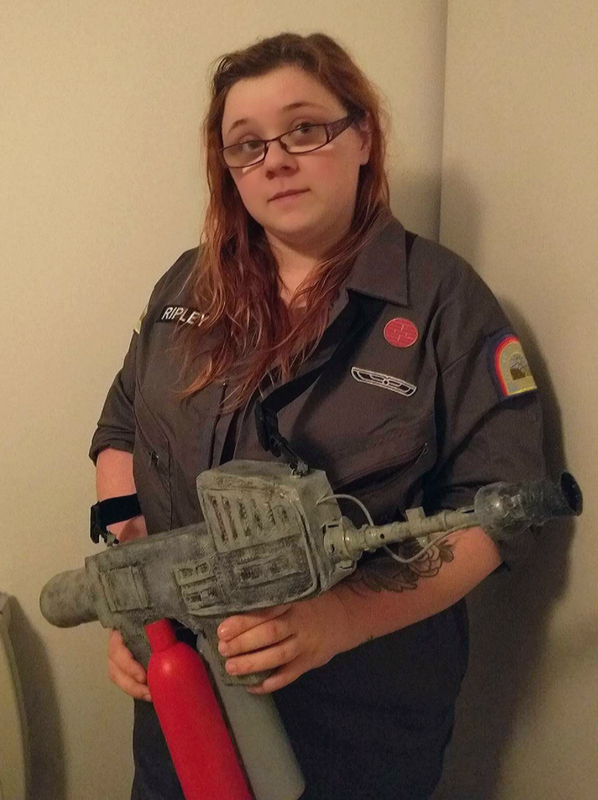 The complicated part was making a replica of the Nostromo flame thrower that she uses to fend of aliens! This is how I did it. First, I took a plastic child’s sniper rifle. I laid it down on foam mat. I then drew around the gun. Around that, I drew the shape of the flamethrower I was trying to recreate. Once done I took apart the plastic gun, cut away any parts that did not fit within the new design, and reassembled it. 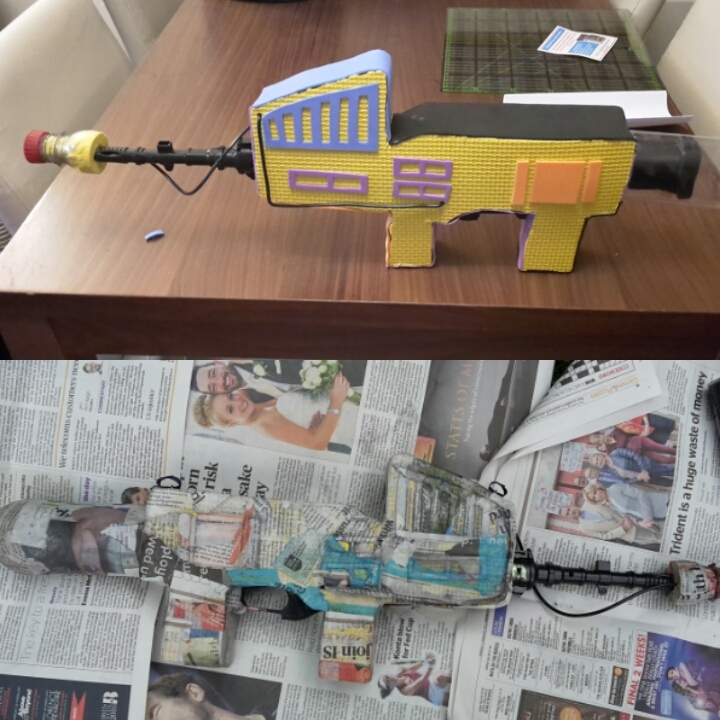 I cut out the flamethrower shape from the foam twice (one for either side) and glued them in the correct place to each side of the plastic gun. Once this was done, I used offcuts to fill the gaps between the two foam shapes and then used some thin craft foam to seal off the edges and join the 2 sides all the way around. Finally, I added a bit of detail with some scrap wire and some foam shapes for buttons and vents. To make the back of the gun, I cut the lid and neck off of a Dr Pepper bottle, then glued it to the back. For the nozzle of the gun, I used the neck of the Dr Pepper bottle with the lid turned the other way around. Once this initial assembly was done, I papermacheted it all. This was to make it more uniform, to smooth down all the rough edges and to make it easier to paint. The next thing to do was spray paint it. 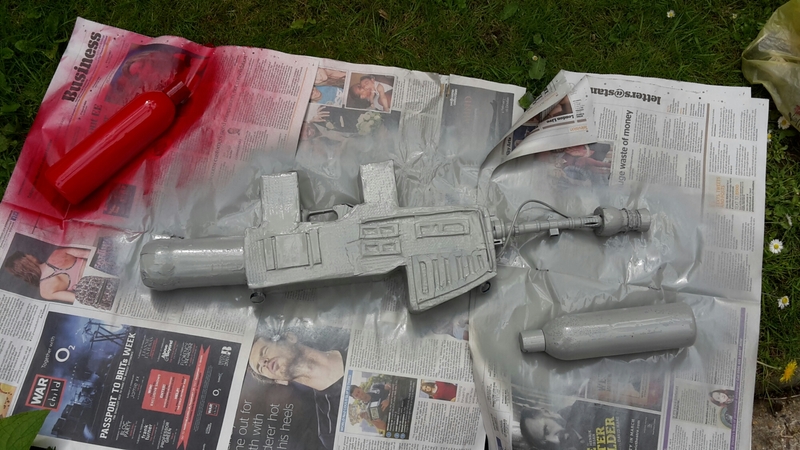 I painted the gun and also 2 shampoo bottles. One in red, and one on grey, as gas bottles for the gun. In hindsight, I should have paper macheted the bottles too, because the paint did not stick well at all! For the final touches, all that was required was some detailing. I used a dry brush to stipple black paint onto the gun then a sponge to mottle it a bit. I also mixed a paint close but not identical to the spray paint, and stippled that on as well to add a bit of an aged worn look to it. I am pretty proud of my handy work! I think it turned out really well. I got quite a few compliments about it at Comic-con. I will definately not be as daunted next time I need to make a replica prop. How cute is this! It is an adorable little brooch I made for my nan ages ago! It was super simple to make and only required a few basic items. Here is how I did it! First I chose 2 contrasting fabrics. I selected them from a bag of scraps I bought from a fabric shop in Maritime Greenwich. The fabrics themselves were expensive per meter, but they had an offcuts and scraps basket where you could fill a bag for just £5. So I filled it full of wonderful colours and textures. I thought these fabrics were really beautiful together. 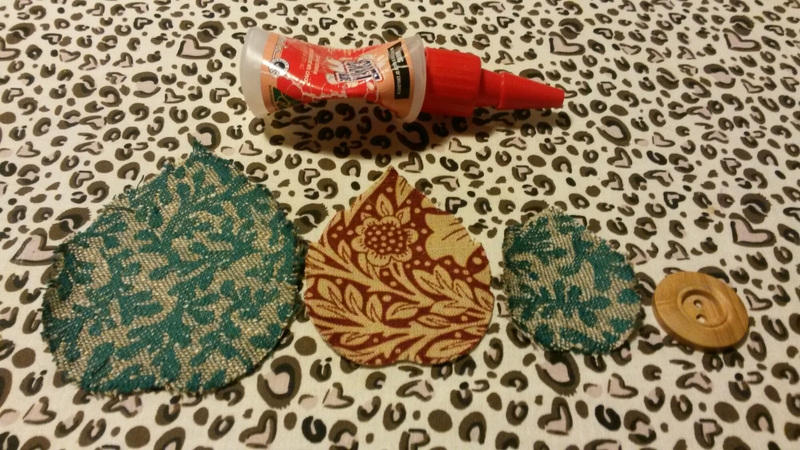 I used my die cutter to cut out 2 leafs from one fabric and one from the other, using my set of X-Cuts Nesting Leaf Dies. If you do not have a die cutter I am sure you could cut it out by hand. It would just be a bit more fiddly and time consuming. 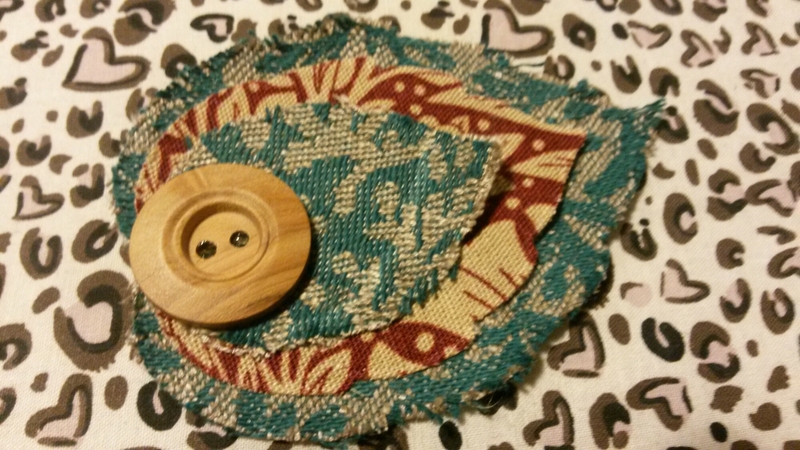 After you have cut the leaves out, all you have to do is layer them up and glue them together, then add the button. 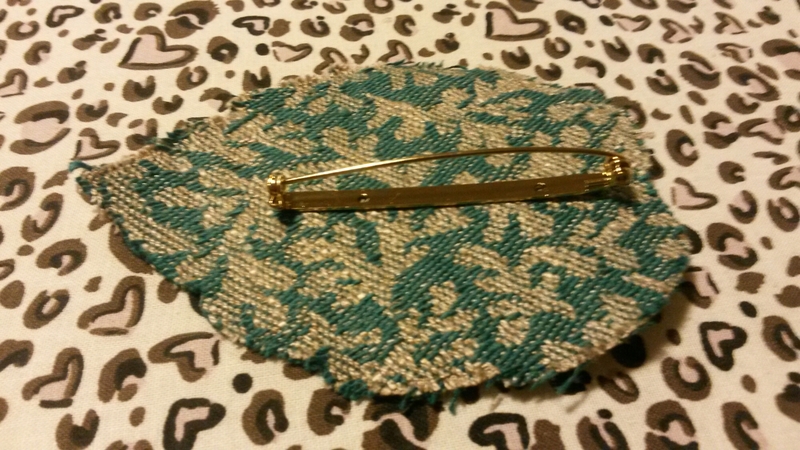 Finally, glue on the brooch pin to the back. 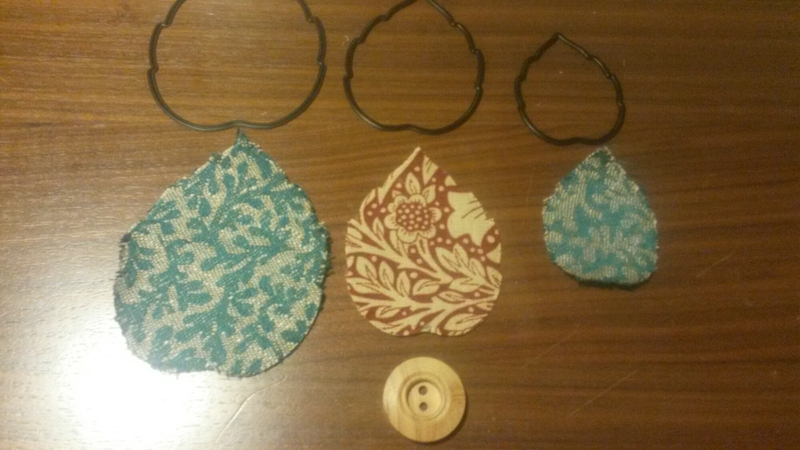 If I had thought of it earlier, I probably would have sewn the brooch pin onto the largest leaf before I had assembled it, but I didn’t think of this until after I has glue it all together. And that is it. All done. This brooch makes a perfect gift. And you can customise it how you like for different people, using different shapes, fabric patterns or buttons to make it unique! What do you think? Cute right. Here is how I did it! 2. Place them in a pan. Then turn the hob on at a low temperature. It will take a while for them to melt down, but it means you have better control over the process. You don’t want it to boil as this could be dangerous! 3. Now we need to prepare the wick. All you need for this is some cotton string. I twisted 3 strands together but in hindsight I think one would have sufficed . Just take a length of string and drop it in the wax for a few seconds. Then remove it with a fork and leave it to set. This should only take a few seconds, but to speed it up you could run it under a cold tap. 4. Now we should prepare the sundae glass. Remove and stickers and make sure it is clean. Then run some water into the glass and swish it around so the inside of the glass is wet but not dripping. Pour out any excess. Now pour in the hundreds and thousands. 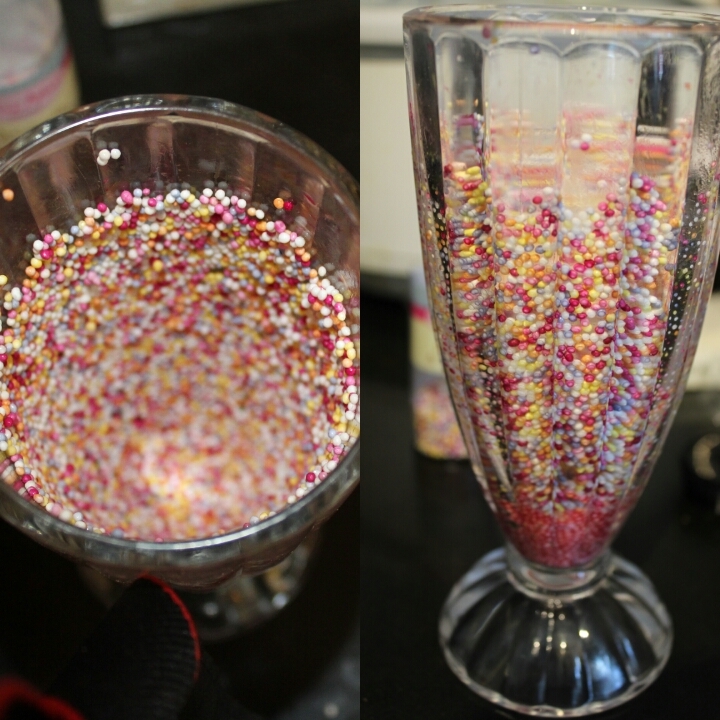 Roll the glass around allowing the sprinkles to stick to the side of the glass. 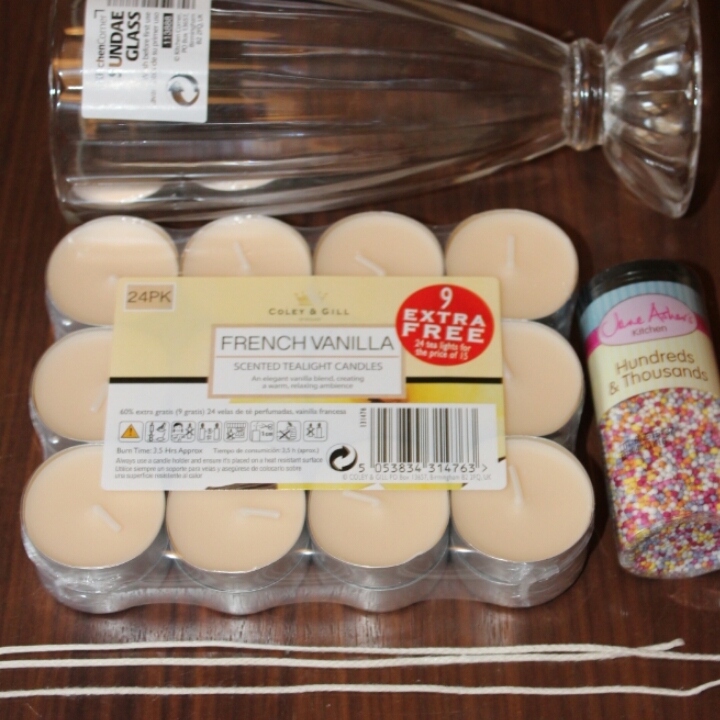 You will loose some of the sprinkles when you pour in the wax so be liberal. Make the sprinkles as thick as you can. 5. Now it is time to add the wick and wax. 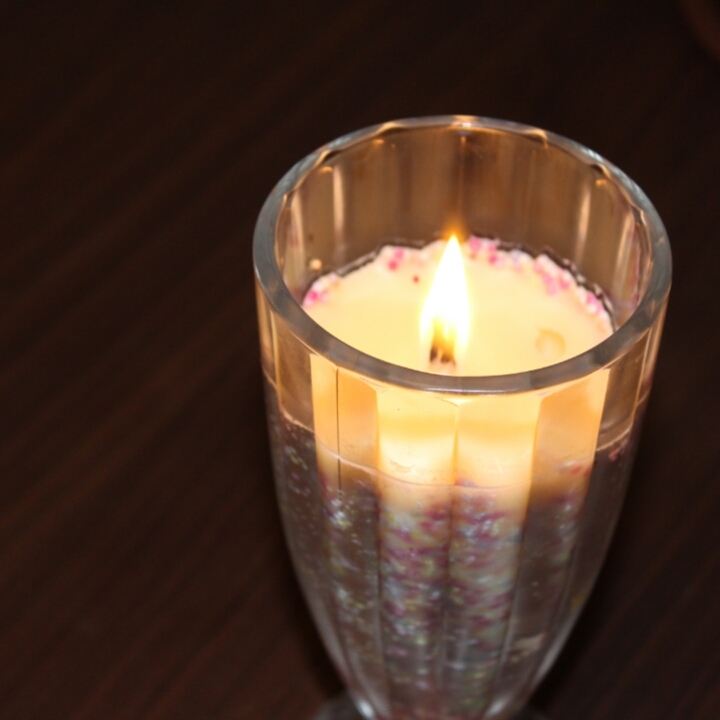 Take the wick and secure it between two pencils or chopsticks. This will keep it suspended in the wax in the correct position. Pour in the wax to the desired level. 6. Now we must wait. It will take a good few hours for this much wax to set. If you would like to speed it up, you can place it in the fridge. Just be careful not to disturb it too much as that can lead to a less clear edge around the top. What do you think. 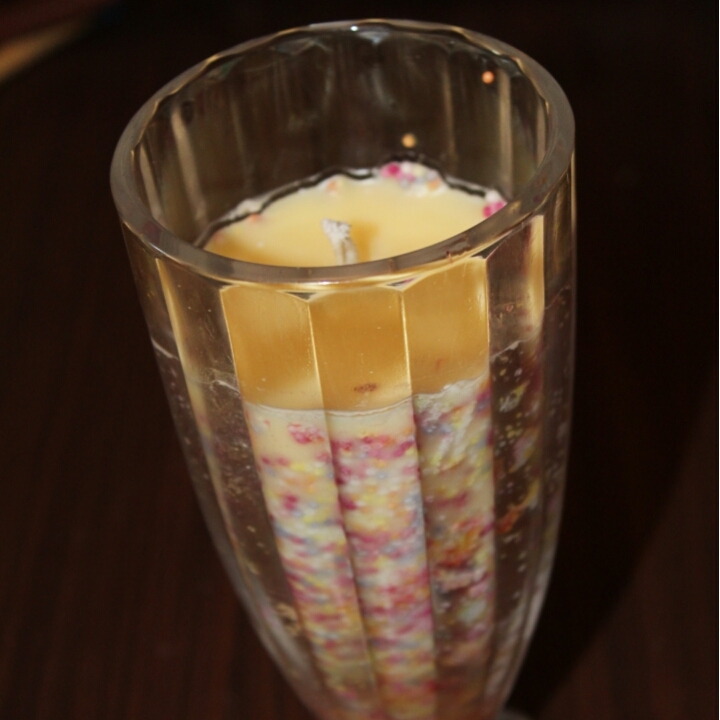 I am really proud of this candle. I think it would make a really sweet handmade gift. And the best part is, it only cost me about £2.50 to make. But it looks like it is worth so much more! Let me know if you have a go. I would love to see your finished result. Or if you have any tips on thrifty handmade gifts, let me know! I Am Going To Hyper Japan! I am Heading To Hyper Japan!!! WOOOOOOOOOOOOOOOOOOO! We got early bird tickets so are getting in for just a tenner! Bargain! For those of you unaware, THIS is Hyper Japan. Its a 3 day celebration of all things Japan, including food, music, culture, video game, anime and of course, COSPLAYING! Which means I needed to come up with a costume! 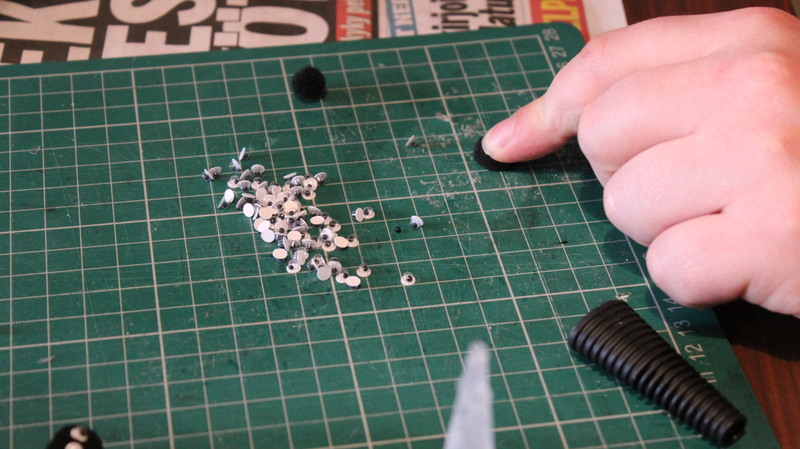 This idea means a lot, and I mean a lot, of black pom poms and googly eyes! So off to eBay I went. Shortly after, little bags of poms and eyes started to arrive in the post. It took a lot of time, but we got there in the end! 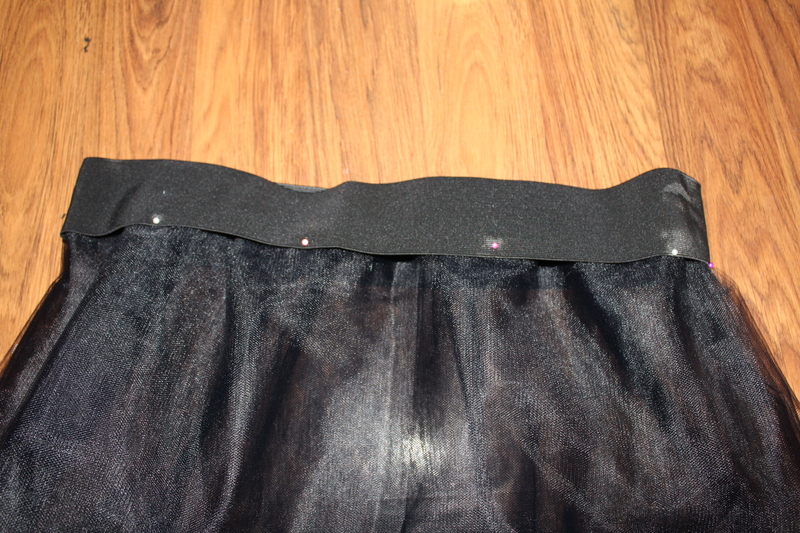 As for the skirt, I needed a tonne of organza and lace, to get the soot cloud effect I was looking for. I ended up with 7 layers of organza in total. 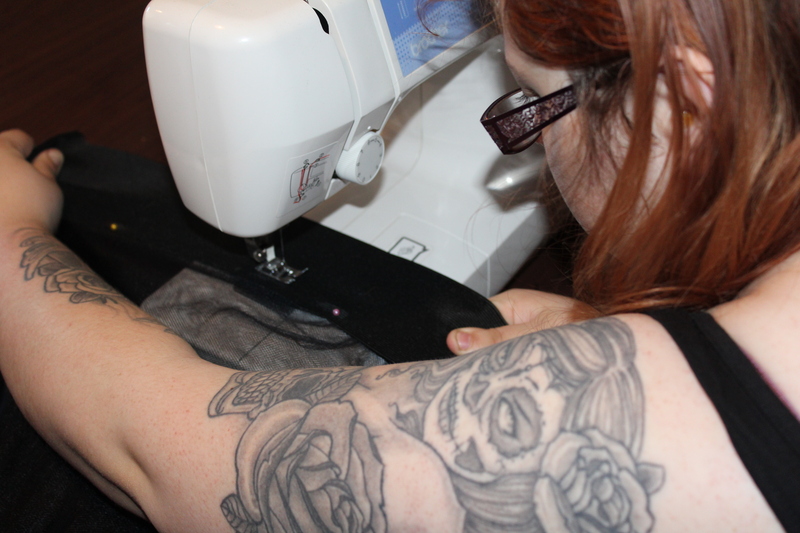 I used a very simple method of machine sewing the organza to the elastic and then hand sewing the gathers.